On their way to huge things, Pale Waves stopped off at Nottingham’s intimate Bodega last week (17/10) as part of their expansive UK tour. From the lengthy line outside the venue door, to the legion of dedicated fans securing their spots front and centre, you’d be forgiven for thinking that the four-piece are further along in their career than they actually are. Latest single ‘Television Romance’ is only the second official release from the group, following the enormous success of debut ‘There’s a Honey’. The two singles bookend the set, with ‘Television Romance’ emerging through the crowd’s rapturous applause and cheers to open. It’s a song that defines their sound as it builds up to the glorious pop chorus, it’s a sing-along moment that gets the audience engaged from the first second. 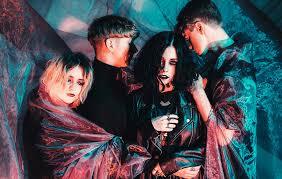 ‘Heavenly’ which has made its rounds on the internet, delivers more of the same distinctive Pale Waves sound, whilst vocalist Heather Baron-Gracie’s favourite track ‘My Obsession’ offers up a slower, more exposed side to the group. Nobody expected anything other than their breakthrough smash as the final song of the evening – even whipping up a small moshpit for it’s final chorus – the majesty of their debut single really underlines what is so special about Pale Waves and why they have garnered such a dedicated audience from the off. Not ones to chunter on between songs, after only half an hour the band close their set and leave the stage without an encore (though, let’s be honest, topping ‘There’s A Honey’ would be impossible). Perhaps used to a support slot set after their US tour with The 1975, perhaps simply not possessing enough material to play for any longer – the short set might have disappointed a few but seeing one of the hottest upcoming talents in a tiny venue for only £6 surely eclipses that minor qualm?